While there have always been norms and customs around the use of drugs, explicit public policies designed to control drug abuse are a more recent phenomenon. Neither a drug-free world nor a world of free drugs seems to be on offer, leaving citizens and officials to face the age-old problem: What are we going to do about drugs? A good first step might be to learn more about them. In this Bloggingheads.tv video, The New Republic’s John McWhorter discusses the controversial topic with Mark Kleiman, author of Drugs and Drug Policy: What Everyone Needs to Know. Mark A.R. Kleiman is Professor of Public Policy at UCLA, editor of The Journal of Drug Policy Analysis, and author of When Brute Force Fails and Against Excess. 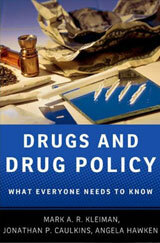 Kleiman blogs at The Reality-Based Community and is also author of Drugs and Drug Policy: What Everyone Needs to Know with Jonathan P. Caulkins and Angela Hawken.